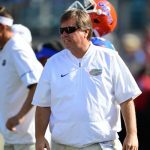 The Florida Gators put themselves in an awful position by losing to Arkansas two weeks ago and now injuries suffered during that game — coupled with ones from this past Saturday against South Carolina — have Florida as a two-touchdown underdog for Saturday when they will hit the road to play the LSU Tigers in Baton Rouge, Louisiana. Florida will be without seven key starters for the game, including redshirt junior LB Alex Anzalone (broken arm), redshirt senior defensive end Bryan Cox Jr. (ankle), senior LB Jarrad Davis (ankle), redshirt sophomore quarterback Luke Del Rio (shoulder), redshirt junior center Cameron Dillard (knee), senior safety Marcus Maye (broken arm) and junior left tackle David Sharpe (foot). Anzalone and Maye are out for the season. Technically, head coach Jim McElwain refereed to Cox as “probably out,” and made it sound like there was a slim-to-none chance that Davis would play, but neither is looking like he will suit up on Saturday. Starting sophomores DE CeCe Jefferson and offensive lineman Tyler Jordan are both considered questionable for the game with ankle injuries. Jefferson missed the South Carolina game, while Jordan — a starting guard who stepped in for Dillard at center — was injured on UF’s first offensive player of the game. 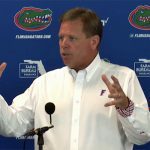 McElwain took time Monday to praise the younger Gators that stepped in for these injured starters, namely redshirt junior defensive backs Marcell Harris and Nick Washington, redshirt sophomore OL Kavaris Harkless, redshirt freshman OL T.J. McCoy and freshman LB David Reese, who led the team in tackles. Maybe we just need to tape our ankles better? Just kidding. If we beat LSU, I will be as shocked as I was to see Trump win the election. We should expect that we will lose a few more starters in the LSU game and then limp into Tally. Could be that, if we get invited to a decent bowl game with a legitimate opponent, this season may end like last season, 0 – 3. O-4 if, by some miracle, the Vols lose to Vandy or Mizzou and we get the privilege of playing Bama. 7 and 5 (or 6) is a real possibility! We graduate 16 seniors and will surely have at least 2-3 early NFL departures. Again, depth on D may will be real concern in 2017. It’s a possibility that we will lose Nussmeier (fired or takes another opportunity). If so, the O will have a new system to learn. I’m expecting it will be at least 2 more seasons before we can hope to be The Mighty Gators again. Looks like there’s some real doom and gloom ahead. I’m tired of this crap!